A number of years ago I set out to dress a selection of traditional North Country spider patterns in the most authentic manner possible. With a degree of enthusiasm that bordered on insanity, I scoured the internet and fishing tackle auctions for vintage flytying materials, blind hooks and the like. And over a period of a year dressed around forty traditional spider patterns to horsehair droppers and the like. But of course, this was only the beginning of the obsession. There came a need to experiment with building and fishing traditional horsehair casts as my final step. So, armed with an extensive library of north country books, private manuscripts and fly wallets. I studied the characteristics and construction of horsehair casts, sure in the knowledge that sooner or later, the reality of fishing with them would take place. Turning to these resources, it became clear that that tradition north country horsehair casts were split into three constituent parts: Points, Droppers and Tops. And that the droppers were often securely placed at the junction of the individual point and top sections, to form the now familiar three-fly cast. Equipped with newly bought mustang tail hair from the US, and a rudimentary idea of how to furl and work with the horsehair. I started to build, and more importantly fish a series of horsehair leaders of my own design and construction. Sadly however, results were inconsistent to say the least. And to be honest, my ability to build quality horsehair casts lacked any form of intuition. Which in turn lead to a gradual wain in my obsession with building and fishing horsehair casts. Many years later however, this dormant interest in horsehair casts was rekindled again, thanks to a series of conversations with Dr Paul Gaskell from Discover Tenkara. Throughout these conversations, Paul championed the qualities of Japanese horsehair leaders used in Tenkara fishing, and their ease of casting. 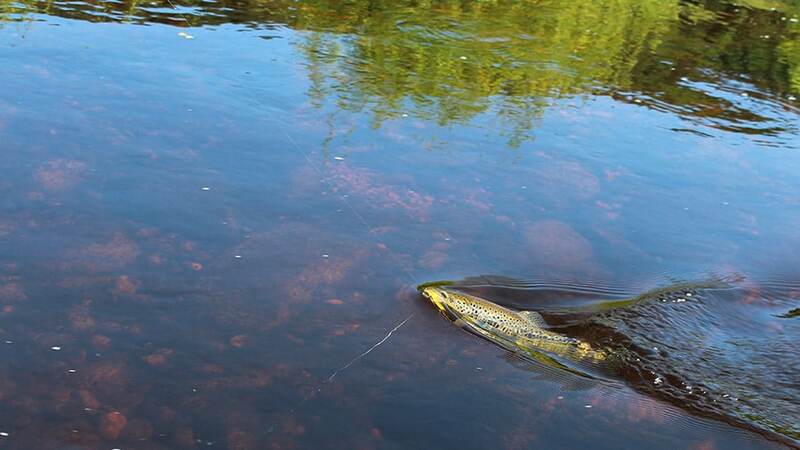 An opinion that not only I respected, but more importantly an opinion that prompted me to once again return to possibility of fishing traditional horsehair north country spider casts. A process which was greatly aided by my acquisition of the John Hubie Pilkington flytying collection. 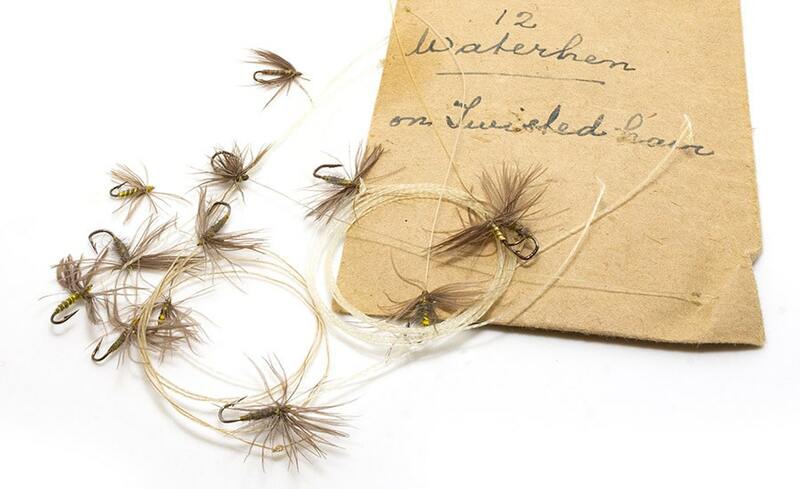 This vintage angling collection not only contained a huge number of traditional north country spiders dressed on horsehair droppers. But also, an assortment of traditional horsehair casts made by many north country flydressers of old. Including James Blades, the famous flydresser and riverkeeper of Hawes in Wensleydale. These Blades’ casts date to 1897, and for the first time they allowed me the opportunity to examine at first hand the north country process of making horsehair casts. Whilst at the same time allowing me the chance to directly experience the way in which he attached his dropper flies. As a consequence, I was also able to see the careful selection of different types of hair that Blades preferred to use. Including his preference for dark hair on his dropper flies. 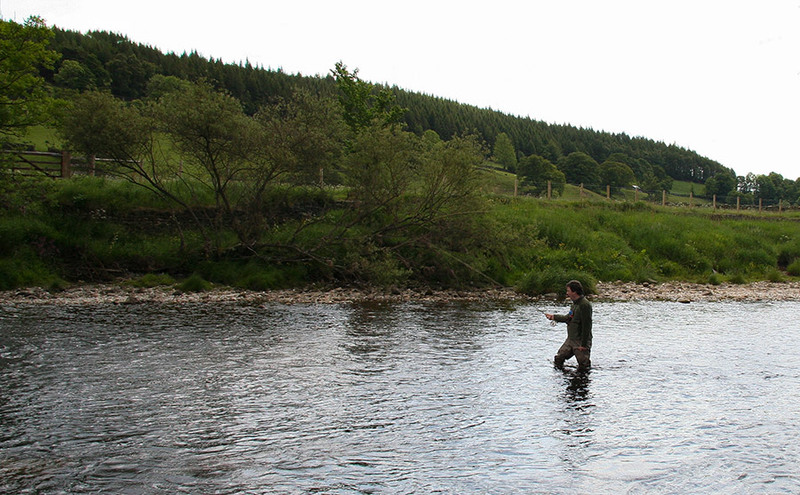 Which to my thinking, may have offered more stealth to the angler in the peat tinged rivers of the Yorkshire Dales. Another aid in my quest to fish traditional horsehair casts, came in the details of a series of horsehair cast formulas, from not only James Blades. But also, Nat Hunt a famous flydresser and riverkeeper from Horton-in-Ribblesdale. Through examining both men’s formulas, it was clear that each had his own preference when it came to length and cast design. Blades, the elder of the two men. Follows the early example of fishing longer leaders with four and sometimes five spiders on his leader. Hunt however uses a more modern set-up, if you call the 1880’s modern! And trims his leader down, to the by now standard 9ft cast of three flies. It is interesting to note that Nat Hunt was still tying and supplying clients with horsehair casts right up until his death in 1938. And that in an age when many anglers were using nylon monofilament and eyed hooks, Hunt’s traditional horsehair casts were still sought after by many north country anglers. With Hunt even being mentioned in several fishing publications by W.K. Rollo, as a great supplier of traditional horsehair casts. Good strong horsehair being now practically imposible to obtain, I have recently, much to my regret, given up using it. When I used to get it fairly regularly in the past I used to keep my source of supply secret, as otherwise it would very soon become exhausted. However, one can still get some very fair horsehair in some of the villages of Yorkshire, and as I have now given up using it, I do not mind giving one address: Mr Nat Hunt, River Keeper, Horton-in-Ribblesdale. He is getting an old man but still ties a beautiful fly – for killing and not for show purposes. I used also to get some very nice hair and beautifully tied flies from the late Mr William Brumfitt, of Otley, a well-know Yorkshire fisherman. So, the Pilkington collect allowed me the prospect of fishing a range of dropper flies from some of the north country’s finest flydressers. Its vast collection of horsehair casts, points and tails, including huge amounts of vintage horsehair. Also offered me the prospect of making my own horsehair casts using the actual materials supplied by these old masters. 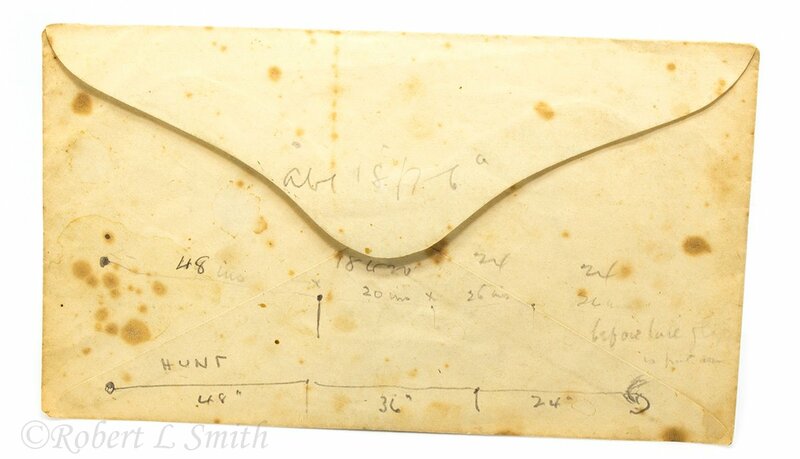 Aided by an archive of flies and letters from Willie Whitaker of Grassington, covering key instructions on the setting up and manufacture of horsehair casts. Now for the first time, I not only had the wherewithal to build horsehair casts to the old master’s specifications, but more importantly was able to fish them on a more constant basis. I have to say my ability to fish traditional north country horsehair casts, instantly changed my views on the notion that traditional anglers always fished their spiders upstream. Horsehair casts simply don’t give you the ability to cut through a stiff downstream breeze. And so, it became immediately obvious, that wind conditions dictated the direction our angling forefathers presented their flies. It didn’t take me long for me to form an opinion of the individual pros and cons of fishing horsehair casts. Though these are probably best left to the insightful words of Richard Clapham writing in his 1947 publication Trout Fishing on Hill Streams. In the old days, and to a certain extent even now, our north-country flies were tied to horsehair. The advantages of horsehair are that it is far more durable than gut, and it possesses a considerable amount of elasticity. You can immerse it in water for any length of time without injuring its usefulness, and it does not fray like gut should it come in to contact with stones or other objects. Even when soaked it still retains a certain amount of “life,” and thus seldom gets tangled up. Should it do so, a little shaking will generally overcome the trouble. One of its great advantages is that dropper flies tied on it stand clear of the main cast and are less likely to catch up in the latter than when using gut. The disadvantages of hair are that once it has been stretched to the limit it becomes brittle and useless, and even the best of hair is much inferior to good gut as regards to strength. Nor can a hair cast be driven so far against the wind as one composed of gut. If hair possessed the strength of gut it would be almost perfect for angling use. Hair is also supposed to be less visible that gut. Sentiments I can only concur with! A horsehair has an elasticity that certainly takes some getting used to when you have been brought up using modern tippet materials with their percentage of low stretch. However, there is a touch and feel to fishing horsehair casts that you simply do not get when fishing modern leaders. There is also something innately spiritual about using a natural material that has been associated with our sport for many centuries. For my part I could also truly give life to the artistry of a generation of north country flydressers and anglers. Finally fishing their vintage flies and horsehair casts within the very landscapes they knew so well. At times sat on the riverbank or wading through a series of riffles and runs. My mind would peer through the receeding gauze of history, and think about the artisans whose combination of flies and horsehair I was casting. And, how over a century later, I was finally releasing their exquisite creations to the fate for which they were intended. The turbulent peat stained rivers, and the mouths of speckled trout. 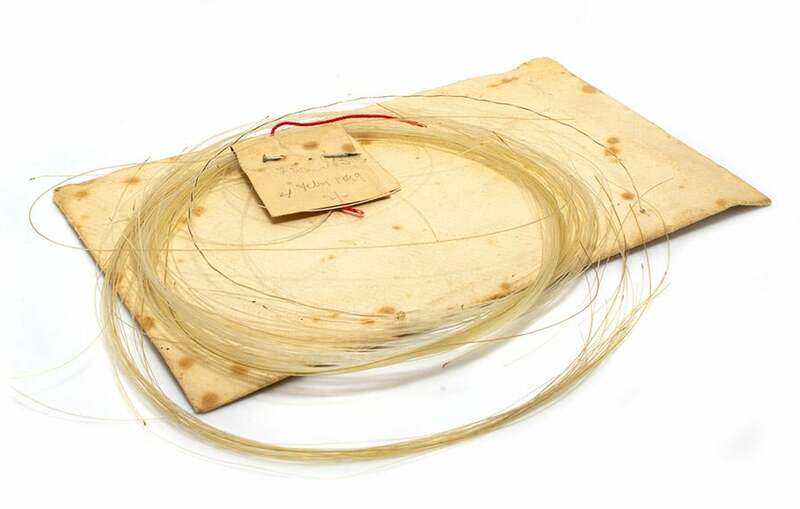 Wharfedale trout on a single strand of 19th century horsehair.